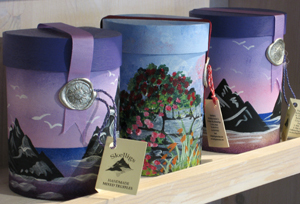 I am happily back in Kerry now, and spent most of a busy bank holiday Sunday in our Dingle shop. The most lasting impression of this last trip and the food world in Paris is how upscale many of the boutiques have become and how far ahead they are in terms of care of mouth-watering presentation and the sheer love of food. From the excess of Hediard and Fauchon to tiny shops selling anything from olive oil to tea to cheese, there is an attention to detail that is lacking in Ireland. And boy, have some of them become super-posh! Ireland has come such a long way, and it is now producing some gourmet food products that I believe are as good anywhere in the world. But in terms of the retail end of the food business, it has a long way to go. It certainly is hard on the feet pounding the pavement in search of tasty treats in Paris, but it’s easy on the eyes and on the stomach! What a great time! 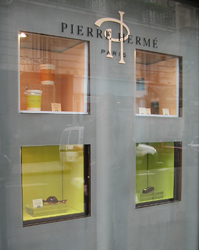 Best Chocolate: Patrick Roger on 108 boulevard St-Germain. This shop is irresistible from the scent of chocolate upon walking in to the huge circular display of treats. Truffles get top marks as does everything we tried. The fact that the chocolatier himself was inside made it that much more special. 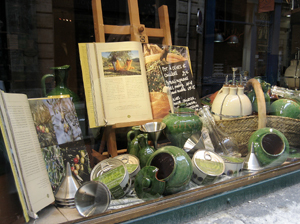 Best Breads: Erik Kayser 14 rue Monge - This is an organic branch just a few shops down from his flagship shop. Fabulous! Best Hot Chocolate: La Charlotte de l'isle 4 rue St.-Louis en l'ile - Don't be shy - march into the back room of this little shop, sit at one of the little tables and indulge in the silkiest, thickest chocolate in the city accompanied by a crystal carafe of water. It's only open Thurs - Sun, but well worth the trip if you need a chocolate high! Most Pretension - Marcolini 89 rue de Seine - The staff wouldn't even look at us in this stuffy shop, and you are taken in the back room to pay (assuming you're up to their high standards). I've never had such a hard time trying to buy chocolate. Ridiculous! Most Interesting - Sadaharu Aoki 35 rue de Vaugirard - Japanese pastry chef meets Paris. Lots of interesting flavours and fun combinations. Don't go if you're astonished by 12 euro bars of chocolate! Best Meal - Casa Olympe 48 rue Saint-Georges - Dominique (Olympe) Versini was the first female French chef to receive a Michelin star. We had a delightful dinner in her tiny bistro near Pigalle. And the value was exceptional! 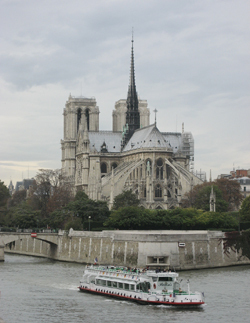 Â I am in Paris at the moment, having come over to attend the Sial food exposition. I did not stay very long at the Expo, however, preferring to wander around the streets of Paris and visit my favourite foodie haunts. More later! I wrote here about Superquinn dropping us and asked for our customers to contact their local shop if they wanted us back and let their feelings be known. We also put a little bit about it on our website. Well, the good news is that we have been asked back into five of their stores, and hopefully will be on the shelves by the middle of November. We are delighted not only to regain the lost business, but also because we have always felt it is one of the best fits for our brand outside of the small gournet shops. 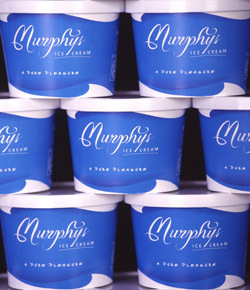 Last week, I was delivering some ice cream down to Urru in Bandon, which is one of my favourite food shops in Ireland. It’s definitely worth a look and taste! Ruth there told me they are opening a second shop in Mallow, hopefully by the end of next month. The lucky residents of Mallow! For us foodies in Kerry, it will just about enough reason to miss the train connection coming from or going to Dublin, just to stock up on goodies! You will find the original Urru at: The Mill, McSwiney Quay, Bandon, Co Cork. Â Today Colm from the Skelligs Chocolate Co. came into our Killarney shop to do a tasting. It’s never any harm to do such a thing, and I certainly got in my few nibbles. 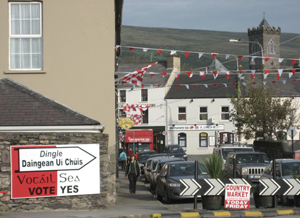 I had to leave to come back to Dingle, but hopefully our customers there tasted a good bit of chocolate! 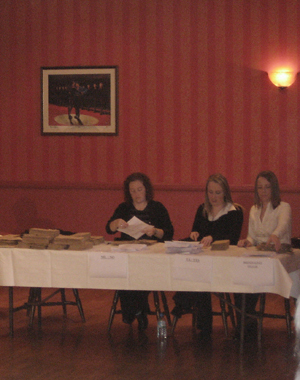 I was just down at the Hillgrove Hotel in Dingle/An Daingean/Daingean Ui Chuis, where they are counting the ballots from the plebiscite regarding the name change. It would seem by the piles that the Tá/Yes votes will comfortable win it, although we will have to wait for the final tally. The turn-out was very high, with 1080 votes cast out of just over 1200. 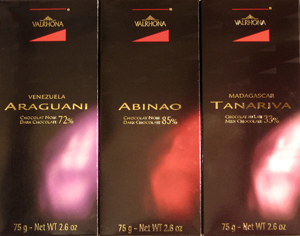 There was great excitement in the shop yesterday as three new Valrhona chocolate bars arrived to add to our collection. Needless to say, we had to rip open one of each immediately to sample (i.e. devour)! 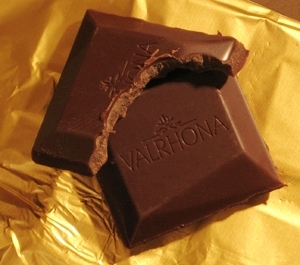 The bars are so new they are only on the news section of the Valrhona website, and they widen the range nicely. Abinao: At 85% cocoa, this bar is a chocolate explosion. Tanariva: A milk chocolate to complement the Jivara, Tanariva has less cocoa content and strong hints of caramel. Although it’s complex and high quality, it’s a good option for people with simpler and sweeter tastes.